Summertime is approaching quickly, and the warm weather will be here before you know it. Take some time away from your snow day to look into the possibilities that await your kids on this upcoming summer vacation. If you’re looking for the right camp, you’ve come to the right place. We’ve pulled together a list of seven great summer camps for your little ones, so please enjoy our Ultimate Summer Camp Guide: Lancaster, PA Edition. It is true that finding the perfect camp won’t make the time go by any faster, but you just might get the early bird price and make it worth it! Happy searching! Snapology has just opened up registration for their summer camp programs! For those of you who are unfamiliar with Snapology, this innovative company focuses on robotics and engineering skills through interactive play for your young ones. This summer they are offering three types of programs for you to choose from: robotics, STEAM, or themed camps. Kids are sure to love learning and playing with all of the fun camp topics that are explored in each program. Some of the skills your child will secretly be learning can include coding, engineering, minecraft, video game design, and animation, all with the help of LEGOs, blocks, and science. Take a look at a few of their interesting classes offered, including “Minecraft Movie Making”, “Pokemania”, and “Junior Scientists: All About Animals”. Encourage their curiosity with a camp that will stimulate their brains and get them thinking! All aboard Science Explorers! Pick any week that follows a science theme your child enjoys and register to get the early bird pricing. Weekly themes include “Take a Dive” (marine biology and oceanography), “Potions, Powders and Polymers” (is it science or magic? ), “Fizz, Bang, Boom, Bot” (robots, physics, and chemistry, oh my! ), and “Ready, Set, Science!” (a different topic each day). This camp is perfect for science lovers and non-science lovers alike, as there is something for everyone to enjoy. Activities include creating kaleidoscopes, playing with bubbles, counting candy, and caring for sea critters. Sounds like fun, but the secret behind it all is science! Your child will love learning how the concepts they love are actually created --and they will become the creators. Are you searching for a family-based camp that specializes in your children being able to pick which activity they like while offering them an experiential education program? 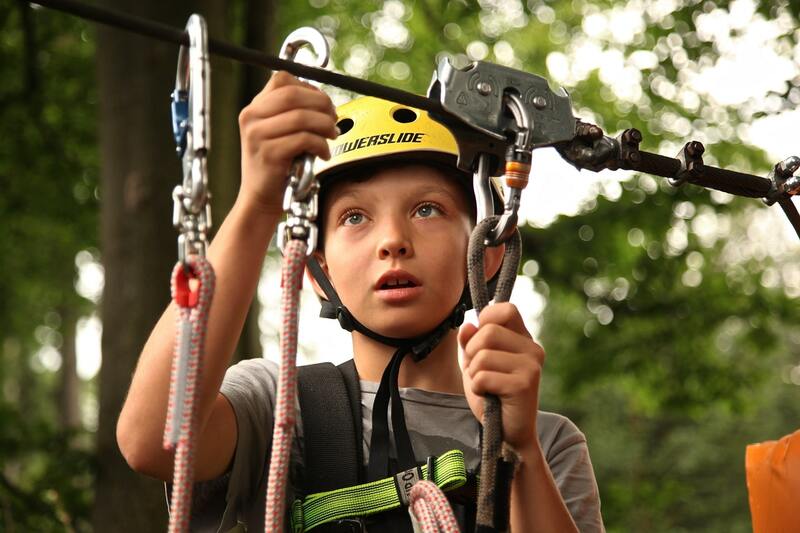 Nature Camps does its best to offer nature to your children in a relatable and enjoyable way. They’ll interact with lakes, fields, streams, woods, and animals, all while hiking and exploring. They can also spend time writing, storytelling, journaling, and learning basic nature tips and tricks to help them become an expert explorer. Nature Camps offers four different programs divided up by age. Toddlers and parents may join “Camp Little Feet, the “Camper Program” is for 4-16 year olds, the “Camper/Explorer Program” for 11-12 year olds, and the “Teen Adventure Program” for 13-16 year olds. Still not convinced? These campers insist they “left their hearts at Nature Camp” and it is truly the “best camp around”. If you’ve never done it, you’ve got to try it! Paintballing is addictive, as they say. Let your kids expel all of their energy at the fun-loving Amber Adventure Park. Reviewers call it a “must go” and the “best time ever”. This two and three day summer camp promises 6 games per day, lunch, technique training, and equipment. The staff and crew are experienced and will work hard to make your kid’s time there memorable and enjoyable. Although fun is at the forefront, safety comes first. They are well trained on safety measures and ensure proper methods for playing in order to ensure a successful and appropriate paintball game. Let your child experience the excitement of airsoft and paintball with their friends and they’ll absolutely thank you for it. We’ve found the perfect place for your little one: Tiny Town! Reviewers have called this magnificent playplace a “wonderland for imagination” where young children can get lost in their own adventures. Tiny Town is a hands-on, interactive play place right around the corner from your home in Lancaster, that is built for both kids and caregivers (that’s you, parents). There are seating areas for adults to supervise and relax at the same time. This weekly camp can include half day or full day options, as well as drop in prices and a special 4-day camp for toddlers. There are also different camp weeks that you can select from, and each week focuses on a unique theme. These themes include, “Race to the Red Planet”, “Secrets of a Mad Scientist”, “The Quest For Nature’s Secrets”, “Breaking the Secret Agent’s Code”, and “The Magic of Mythical Stories”. Have your kid pick and the rest is easy! Interested in a summer camp that instills a little more of your family’s values? Experience something unforgettable at Tel Hai Camp & Retreat, a beautiful campground that offers events, retreats, and summer camps for those looking to get closer with the Lord. Their Christian mission is to provide a place where children and families can nurture their relationship with God, themselves, and nature. Two of the summer programs offered include “Adventure Camp”, a two-week overnight camp of swimming, playing, and other special activities, and “Dad & Lad Camp”, a father-son quality experience that focuses on sharing special moments with your little one through archery, ziplining, and fishing. Both camps create an atmosphere of honesty, sharing, and openness through these special activities and attention to Christ. Enjoy! Nostalgia may be the mission of Saginaw Children’s Camp, because this camp is sure to hit home. This premier sleepaway camp focuses on positive growth in a nurturing environment for your children, and through your favorite outdoor duties as well. If your children attend Saginaw’s, they’ll be participating in a slew of super-fun activities like kayaking, mountain biking, lazer tag, jewelry making, scrapbooking, frisbee, tennis, theater, tubing, archery, and dance. Cue the waterworks because you know they have s’mores and ghost stories over the campfire. This ultimate summer camp is truly the “best camp ever”, so don’t miss out. Soak up the fun and sign up today!